The Cumberland & Dumfriesshire Farmers Mart P.L.C. 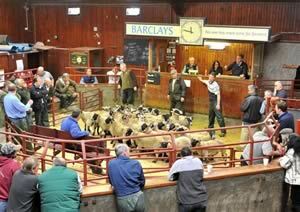 had forward 61 prime cattle, 1 young bull, 26 over thirty month cattle, 989 prime lambs, 1,623 prime hoggs and 3,203 cast ewes & rams at their weekly sale at Longtown on Thursday 10th June, 2010. Prime cattle saw trade sharper on the week. Top price of 169.5p for a Limousin heifer from Hallburn; Charolais 165.5p Hallburn, 164.5p Sceughdyke. Limousin bullocks to 168.5p Dashwellgreen, 164.5p The Gill, £163.5p (x2) Dashwellgreen. The 26 OTM cattle saw leaner sorts dearer on the week. Limousin cows 124.5p (£821) Slealands; Charolais 111.5p Blindhillbush; Angus 90.5p Hutlerburn. Heifers to 155.5p for Angus from Burnfoot on Esk. Bullocks to 115.5p for Galloway from Burnfoot of Ewes. Bulls to 107.5p for Galloway from Burnfoot of Ewes. A larger show of 989 prime lambs sold to the usual ring of buyers to level out at 188.2p per kilo. Trade was slightly easier on the week with many firms still in the process of changing over from hoggs to new season lambs. Top price of 235p per kilo and £96.50 per head for Beltex’s from Mr J.M. Richardson, Newington Avenue; Suffolk £89.80 Fenton, £88.80 Englishtown, £86.80 Miller Hill and The Land; Texel £93.80 Wyseby Hill Cottage, £92.20, £90.80 The Whins; Charollais £81.80 Old Rectory, £78.80 Hallburn; Oxford £81.20, £80.80 Guards; Dorset £70.20 Farmers Close; Leicester £68.80 Harelawhill; Greyface £66.80 Hallburn. A considerably smaller show of 1,623 prime hoggs, with many consignors having an end of season clearout. However, hoggs that were well fleshed were still needed, leading to a sale average of 148.9p per kilo. Top price of 184p per kilo for Texels from Gate & West Farm and to £88.50 per head for Suffolks from Sceughdyke, others £79.50 Compstonend; Texel £86.50 Kilmaho, £85.50 Stackbraes, £84.50 Compsonend; Greyface £82.50 Drumbreddan, £72.50 Stackbraes and Hopestead; Half Bred £78.50 Stackbraes, £70 Sockbridge Hall; North Country Cheviot £73.50, £71.50 Sockbridge Hall; Blackface £72.50 High Staward, £71.50 Meggethead, £70.80 Drumbreddan; Zwartbles £66.50 Croft Head; Charollais £66.50 Cara View; Hill Cheviot £65.80 Gate & West, £59.50 Newhouse; Beltex £62.50 Shawsfield; Wensleydale £60.50 Cruachan; Jacob £60.20 Plumpe, £59.80 Shawsfield; Bleu d’Maine £56.50 Cruachan Cottage; Herdwick £56.50 Alton; Swaledale £52.50 Newbiggin, £44.80 Whinfield. A smaller show of 3,203 cast ewes and rams sold to the usual full ring of buyers. All classes sold to a good trade, keeping in line with recent high rates. Top price of £168.50 for a Leicester tup from Cleugh Head, £142.50 Gapshield; Suffolk £146.50 Gill Farm, £143.50 Yewtree; Charollais £143.50, £133.50 Gate & West; North Country Cheviot £136.50 Newbigging, £98.50 Hallum Forss; Zwartbles £130.50 Stackbraes, £118.50 Severs; Texel £129.50 Coytre, £128.50 Todhillwood; Hampshire £126.50 Killinochonoch; Bleu d’Maine £93.50 Roadside; Hill Cheviot £90 Road Side; Beltex £88.50 Newbigging; Blackface £88.50 Redesmouth, £71.50 Meggethead and Chaplehope; Swaledale £86.50 Brownleazes, £66.50 Newbiggin; Lleyn £78.50 Stackbraes; Romney Marsh £70.50 Marygate; Herdwick £60 Gate & West; Shetland £36.50 Midtodholes. Heavy ewes to £138.50, £124.50 for Suffolks from Stackbraes; Texel £128.50, £126.50 Newbiggin, £123.50 Oatfield Lodge; Leicester £116.50, £103.50 Alton, £98.50 Brownleazes; Bleu d’Maine £112.50 Roadside, £108.50 Cruachan Cottage; Beltex £110.50 Stonehouse, £97.50 Colter Coats; Charollais £108.50 Roadside, £91.50 Whinfield; North Country Cheviot £106.50 Hillhead, £90.50 Roadside; Half Bred £92.50 Guards Mill, £91.50 Marygate; Greyface £88.50 Brownleazes, £86.50 Tangytavill, £83.50 Cowans; Cheviot Mule £84.50 Newington, £74.50 Nether Stenries; Dorset £78.50 Severs; Zwartbles £74.50 Stackbraes; Easycare £71.50 Glenapp; Romney Marsh £62.50 Marygate. Hill ewes to £80.50 for Blackfaces from Brownleazes, £76.50 High Staward, £74.50 Cruachan Cottage; Hill Cheviot £74.50 Stackbraes, Glebelands and The Gill; Welsh Mountain £72.50 Gate & West; Swaledale £70.50 Yewtree, £67.50 Reaygarth, £63.50 Whinfield; Lleyn £69.50 Newbigging, £62.50 Glebelands; Shetland £65 Coytre; Beulah £55.50 Dairy Farm; Herdwick £46.50 Whinfield, £40.50 Ashley Park.